Deepavali falls on the 29th of October, 2016 in Tamilnadu. 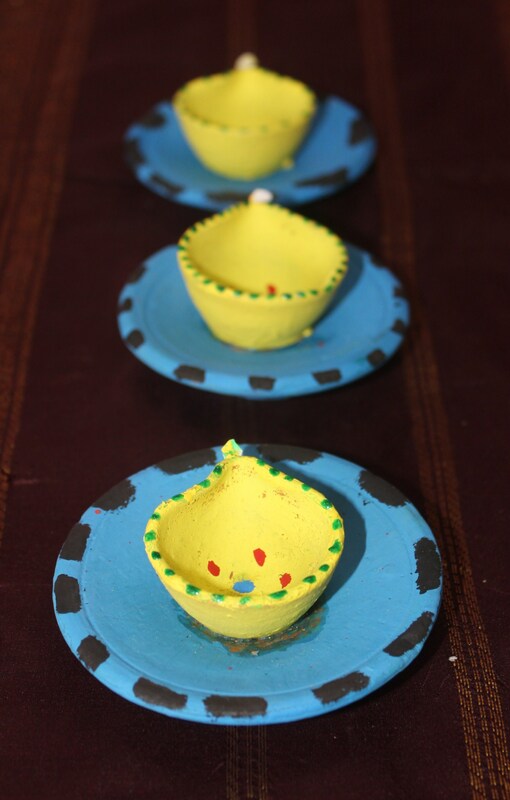 If Deepavali means lots of happiness and loads of sweets and snacks- the festivity arrived a week earlier at home. 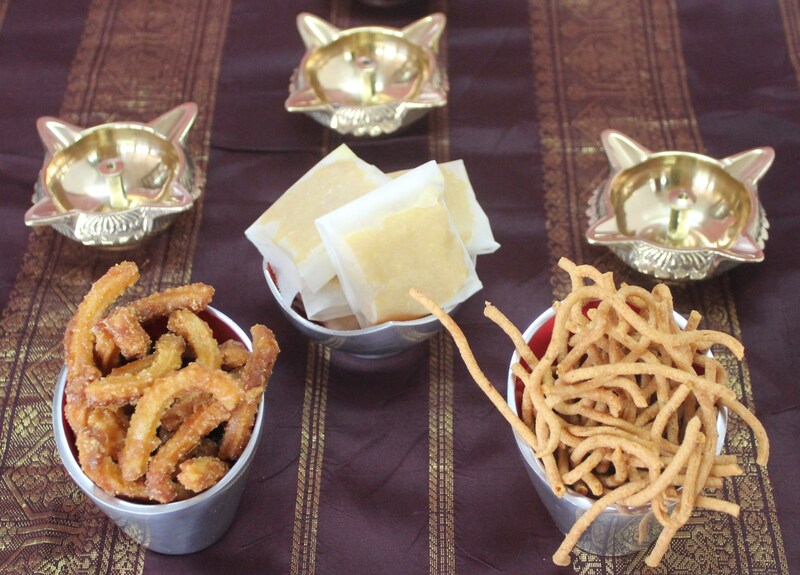 In the earlier decades of joint families or extended families close by, or at least a few siblings to share and pick up the last bits of sweets and snacks from the thooku chatti, festivals meant making of sweets and savories literally in several kilograms if not tonnes. Presently, with nuclear families, especially with single children or children in different destinations, the sweet and savories story isn’t a kilogram affair, but has become a ‘grammy’ indulgence. Additionally, there is no aachi-amma duo to occupy the kitchen for consecutive hours, patiently filling the big chattis with goodies. Making so many delicacies in a couple of days fit for consumption for diwali and a few days beyond has become too strenuous now, atleast for me. 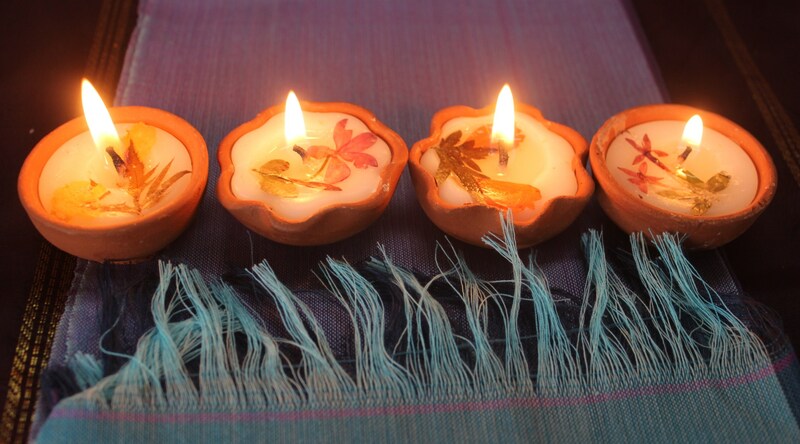 But, when the most important ingredient of a good festival – the energy to make and share traditional sweets and savories was still bright and shining as the lights of Diwali, there arose a patient plan. The patience behind making several goodies gave rise to a Pre-Diwali weekend.Instead of slogging in kitchen with so many things in mind, I started off with a few last weekend. 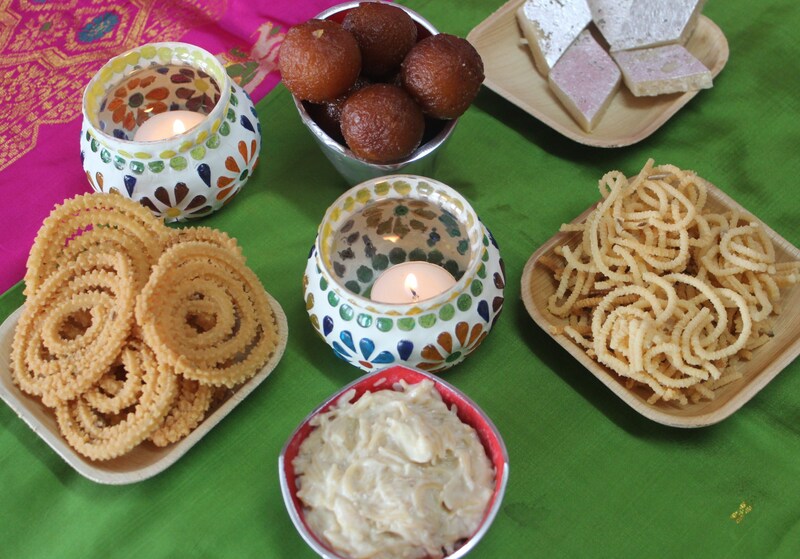 Festivity started a week earlier, yes- for the sheer temptation of making more and introducing more traditional sweets and snacks. Cooking is a bliss when you have people around to gobble it in a jiffy. Now, I really miss the ever hungry tummy of my little brother, who let amma and aachi feel delighted to make more and more ‘norukku theeni’ aka nibblers with the same enthusiasm for years together. Yet, I have a little nibble hunter, who is as enthusiastic to taste new palagaram/snacks as to cook a few. 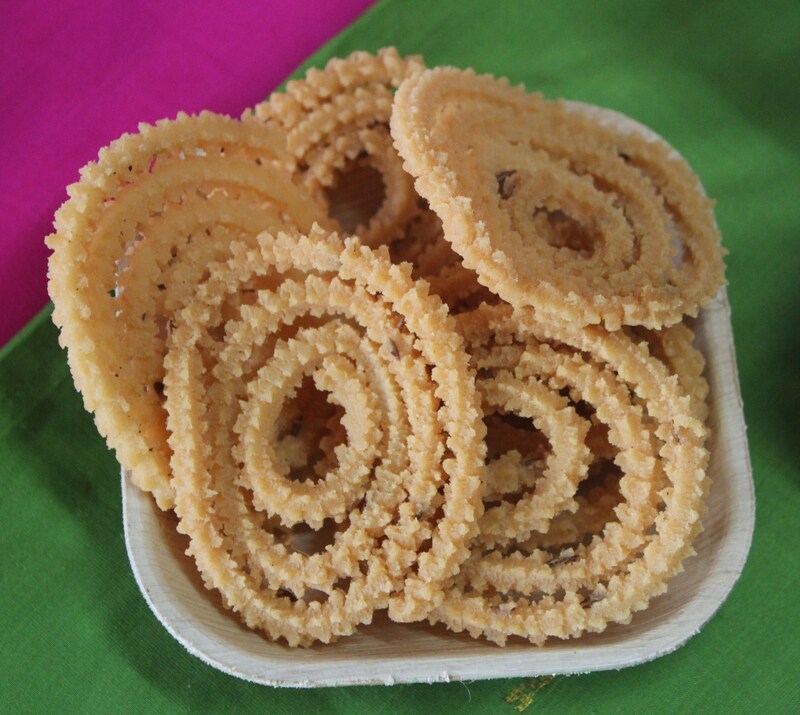 Mid way in the week, started off with the true notion of cooking traditional sweets from the place I hail from – Tirunelveli. Thiripagam, Manoharam and Kara Sevu passed to the top of the list. If the first two resemble names of mythical characters beyond seas, that’s merely co-incidental. 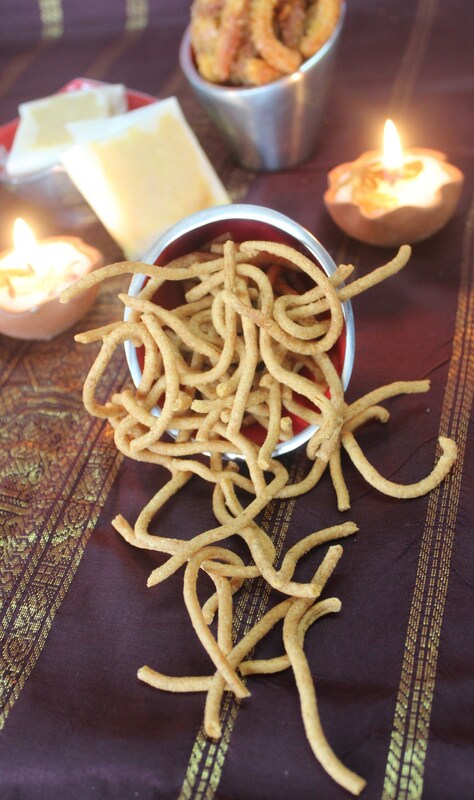 Not to worry, they are sweets and the third one is a popular spicy savory, available throughout South India. First, to the most uncommon among the three – Thiripagam. When Amma had already started with Thiripagam – a long forgotten sweet, I just grabbed the opportunity of introducing the same here. Thanks to her, took step by step instructions to make. I was introduced to this elegantly presented sweet in my uncle’s marriage. The feast had this different sweet, but with a very familiar taste. 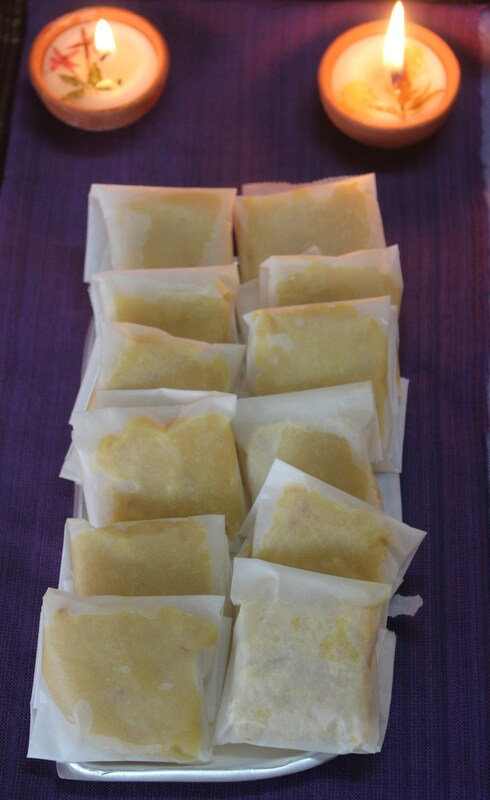 Was it Mysore Pak or Badam Halwa ? 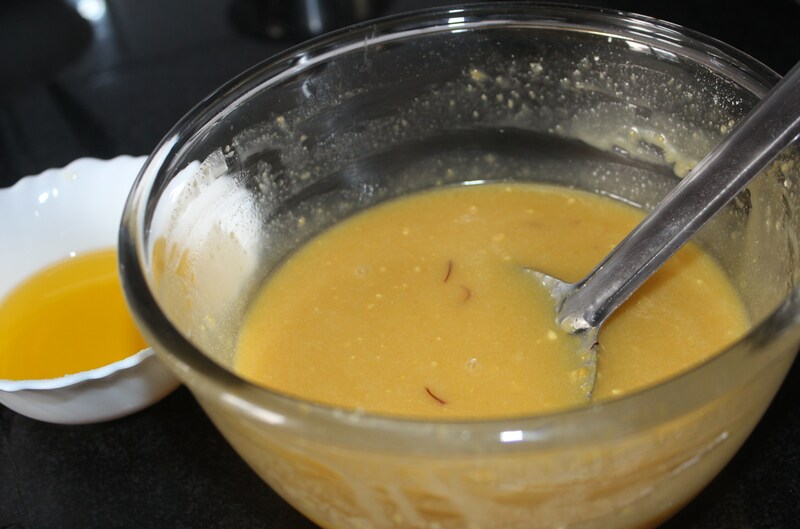 The former is the ghee oozing/melting in the mouth sweet with bengal gram flour and the latter is the wonder pudding with the goodness of almonds. Now, Thiripagam is somewhere between both. 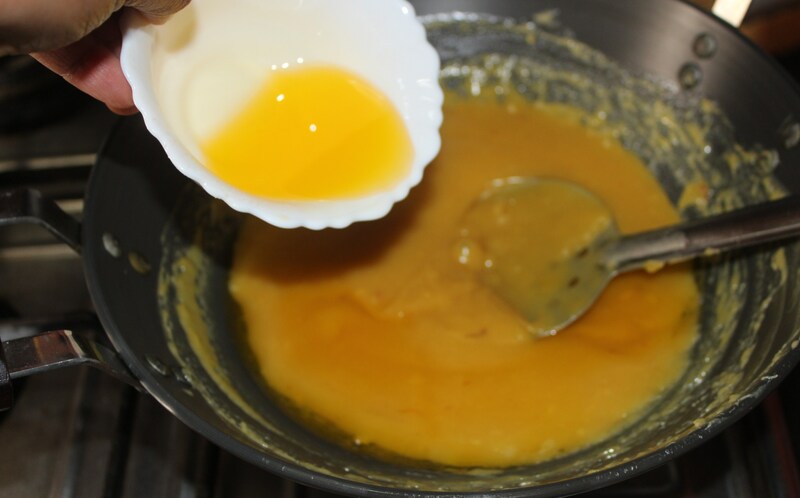 Kadalai Maavu or Bengal Gram Flour is the base ingredient with equal proportion of nei/clarified butter. 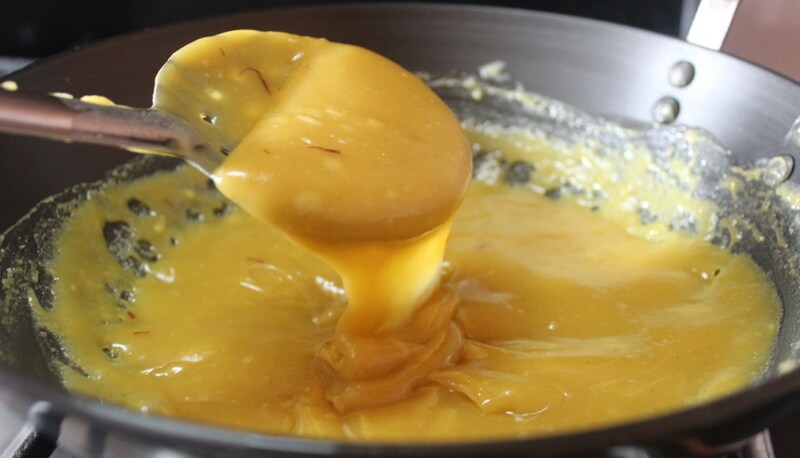 Add the sugar and it would very well become mysore pak. 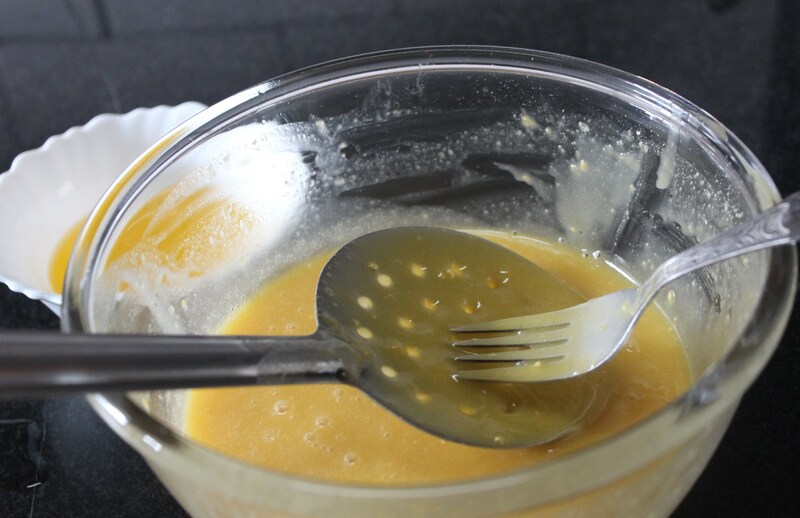 This sweet has an additional inclusion of milk to the gram flour, that acts as an alternate to the almond milky flavor. 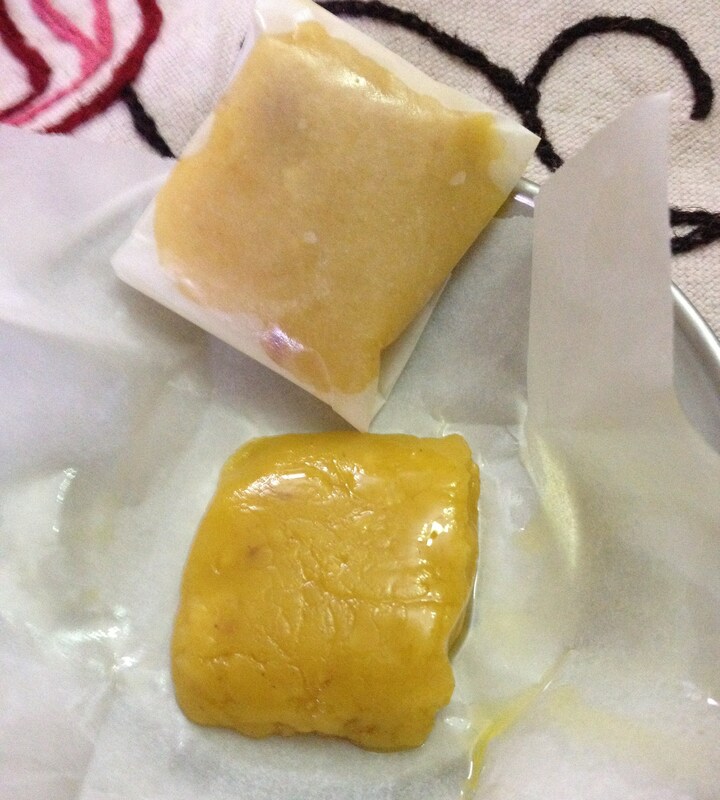 These might be reasons for the resemblance of Badam Halwa and familiarity of Mysore Pak. The pudding is shaped in rectangles or squares and wrapped in cookie sheet/butter paper. This is what aids in its elegant presentation with the distinct taste. If made in a micro wave, this is certainly a 10 minute sweet to prepare. 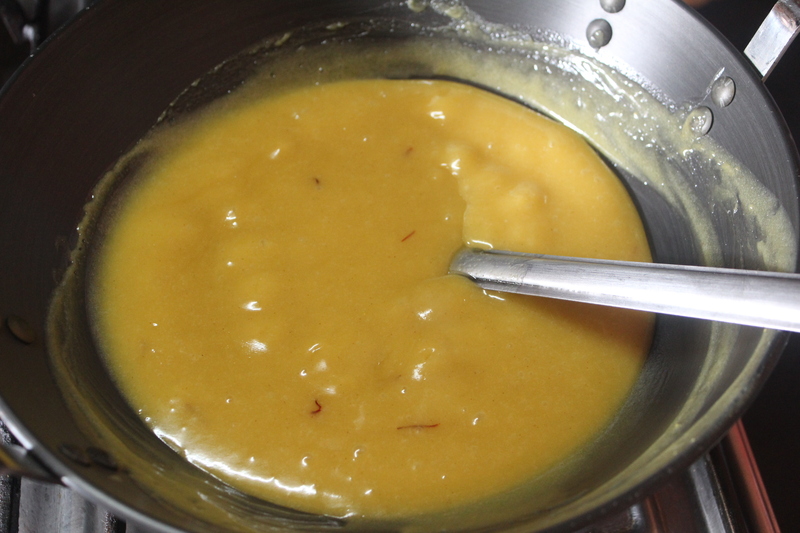 But since I don’t prefer micro wave cooking, I’ve done in the pan, which took about 30 minutes of stirring to reach the adequate kali/halwa consistency. 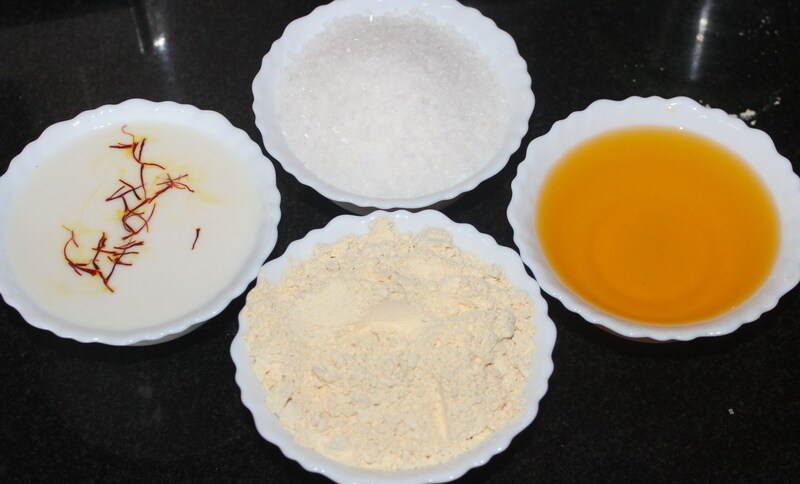 Thiripagam, – which means three parts, where the name must have come from the three core ingredients – bengal gram flour, clarified butter and milk. Though Amma mentioned the quantity of sugar could vary between 1 1/4 to 1 1/2 cups, I added only 3/4th of a cup. One can alter as per their sweet preference. Another alteration I made was the deduction of pachai karpooram/edible camphor. The flavor of the sweet comes from edible camphor, but I thought saffron could be a flavorful component to this exceptional sweet. 15. 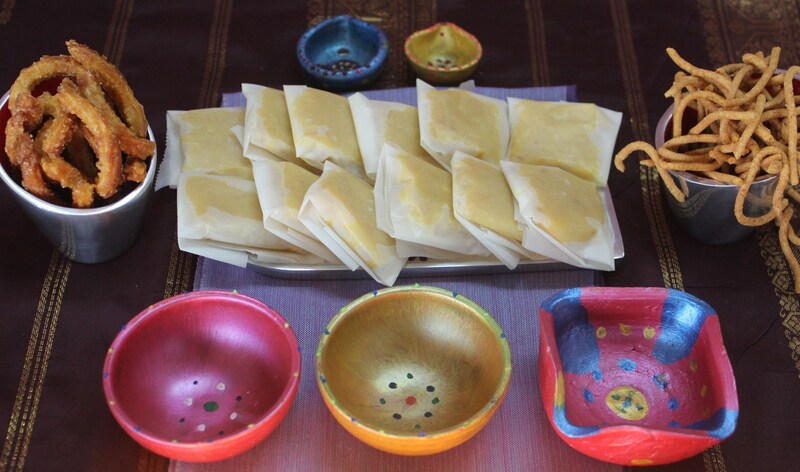 Thiripagam is ready in its perfect presentation.